까막딱따구리는 유럽과 아시아 지역에 분포하며, 우리나라에서는 제2차 세계대전 전까지만 해도 중부 이북지방에서 흔히 볼 수 있었던 텃새이다. 몸길이는 46㎝ 정도이며 온몸이 검다. 수컷은 머리 꼭대기가 붉고, 암컷은 뒷머리만 붉다. 부리는 회백색이며 끝이 검다. 삼각형의 뾰족한 부리로 나무를 잘 쪼는데, 나무는 쪼을 때마다 산이 울릴 정도로 둔탁한 소리를 낸다. 4∼6월에 3∼5개의 알을 낳으며 먹이는 딱정벌레의 성충과 유충을 즐겨 먹으며 개미와 파리도 잘 먹는다. 가끔 식물의 열매도 먹는다. 까막딱따구리는 오래된 나무에서 생활하는데 사람들이 나무를 함부로 베어내서 생활터전이 많이 파괴되었다. 이로 인해 까막딱따구리의 수도 급격히 줄어 오늘날에는 매우 희귀한 텃새가 되었으므로 천연기념물로 지정·보호하고 있다. 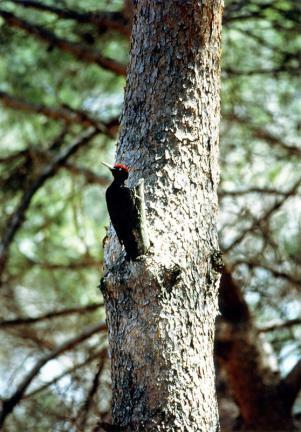 Great black woodpeckers (Dryocopus martius linne) inhabit Europe and Asian areas. In Korea, they were easily seen in the central and northern areas. 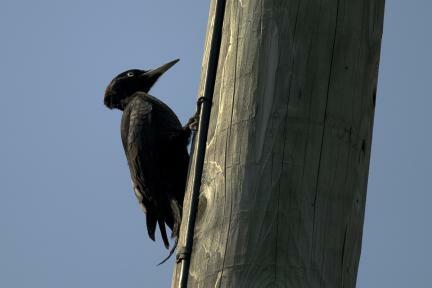 This bird is about 46cm tall, and its whole body is black. Males have a red crown, whereas the back of the head of females is red. The beak is yellowish-green, and its tip is black. This bird pecks trees with its pointed, triangular beak. When it pecks trees, it produces a loud noise that can reverberate throughout the mountain. From April to June, it lays 3~5 eggs. It usually feeds on imagoes and larvae of beetles, ants, flies, and fruit. 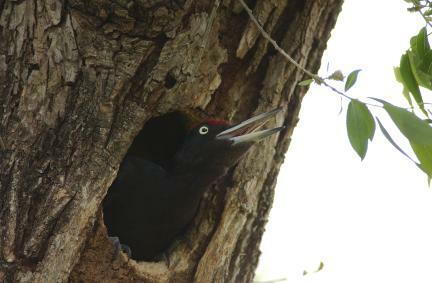 The great black woodpecker lives in an old tree. With people cutting down trees indiscreetly, the habitat of this bird has been damaged. 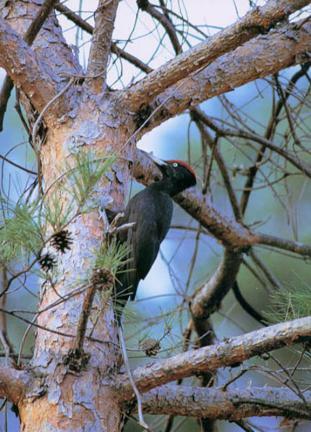 Moreover, the number of woodpeckers has decreased, and it has become a rare bird. Therefore, it is designated and protected as a natural monument.